I always have to stop myself from saying it out loud, because if you haven’t seen The Holy Grail (I mean the cinematic, not the biblical one), you might think I’m nuts. So what’s a drink shrub? It’s an old-fashioned sweet-tart-fruity syrup that was originally a way to preserve an abundance of fruit with sugar and vinegar. It’s also sometimes called “drinking vinegar.” A shrub is basically equal parts good vinegar, seasonal fruit, and sugar. Some people add herbs and spices to make things a little more interesting. You can mix your shrub syrup with soda water for a great, not-too-sweet homemade soda. It’s also a great base for creative cocktails. I myself am jumping on the shrub wagon rather late. The impetus is the 38th Annual Symphony of Food, Wine, & Art, for which I am organizing and conducting a series of artisanal food demonstrations. The idea is to take the best products made locally and showcase them in creative ways. 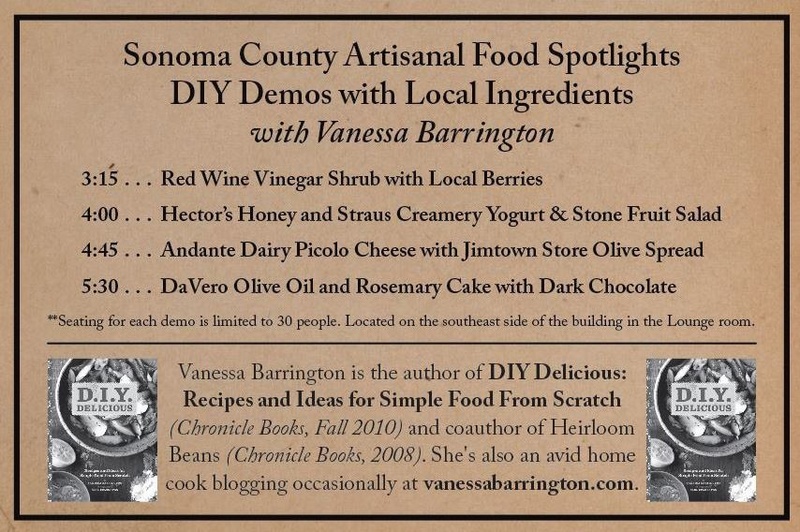 It’s a great opportunity to talk about the importance of using good ingredients whether you make them yourself, DIY Delicious style, or buy them from a local artisan. Case in point: if you’re going to drink vinegar, it better be good vinegar. The event is Sunday, June 23rd from 3 – 6pm at the Rohnert Park Community Center. Tickets are $45 and available here. That will get you tastes of lots of great food and wine. Highlights include award-winning sandwiches from The Farmers Wife using Harley Richter Meats. Yum. I didn’t know how to make a shrub so I turned to this recipe in Serious Eats. I started with the excellent black currant vinegar from Sonoma Vinegar Works, and a mixture of local blackberries, raspberries, and strawberries. But you could use stone fruit, melon, or other fruits. You could infuse aromatics like ginger, celery, or cucumbers, and of course, as I mention, you could add spices or herbs. Being my first time, I kept it simple. It was easy, fun, and it’s damn nice looking. You should try it yourself. Now where’s the vodka? I’ve always been a by-the-seat-of-my-pants kind of home cook. When I’m not working and thus don’t have to write down or follow a recipe I am happy not to. 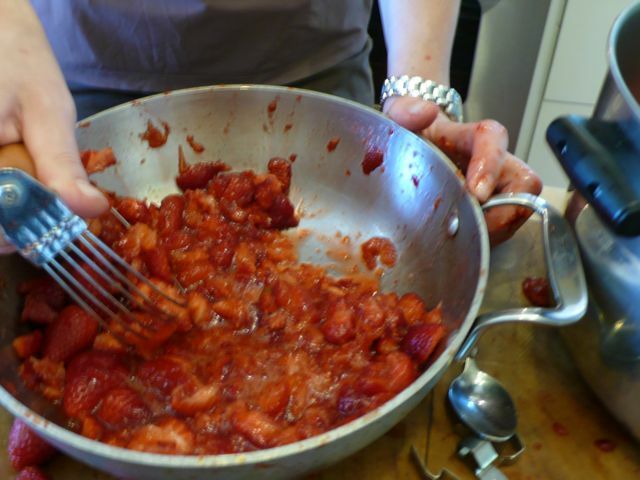 Last weekend, I set out to make strawberry jam. I knew just what I wanted…the purity of fruit without too much sugar; a spoonable preserve with a fresh, not-too-cooked flavor. I usually try to do as little as possible to jam and use as little sugar as I can get away with. These goals can conflict because long cooking and more sugar both help to thicken the jam, as does pectin. 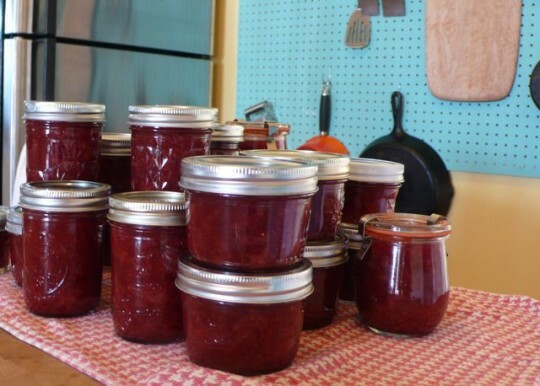 A lot of people don’t like to use pectin because it is considered an unnatural additive and it can over-jell the fruit and make the jam grainy. For this reason, I generally don’t use pectin. But I also don’t like to cook the jam too long because it loses its fresh flavor, and I like to cut the sugar considerably from the usual recipes. Some recipes call for more sugar than fruit, which is just wrong. 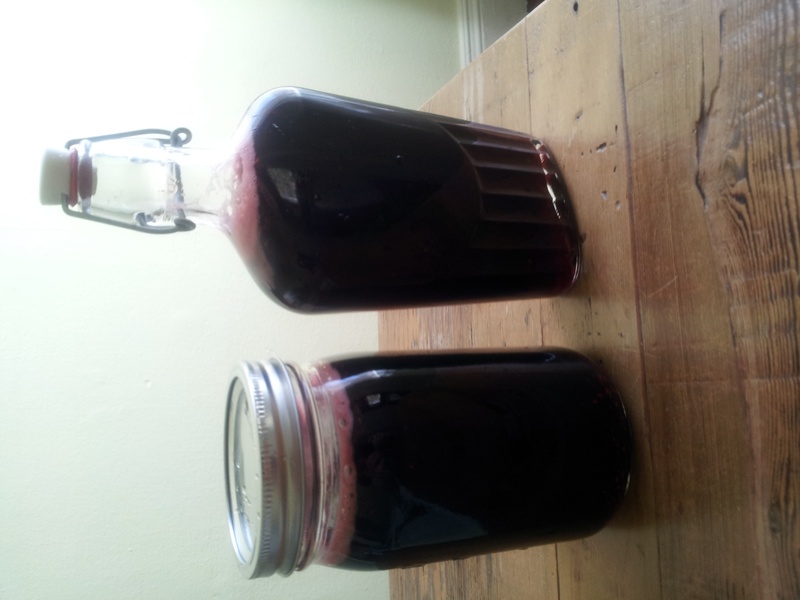 I have good luck with low sugar, no pectin plum and blackberry jam because those are higher pectin fruits. 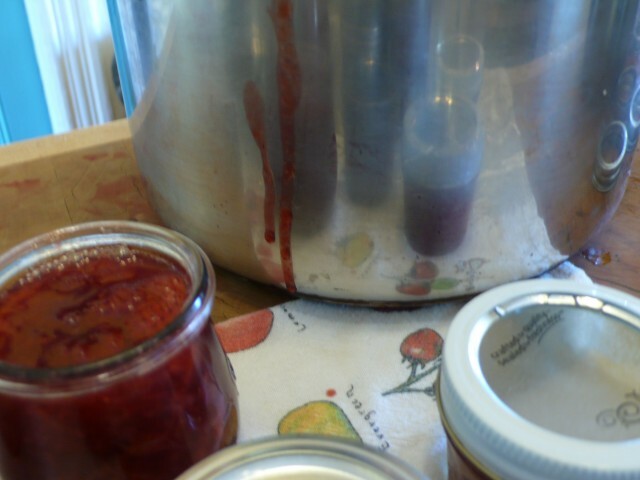 I’d never made strawberry jam, so , for the first time, I decided to experiment with adding pectin so I could use less sugar and not cook the crap out of the perfect fruit I’d procured. There was part of a box in the house from someone’s previous experiment–not really enough. So I did what I always do: looked at a bunch of different recipes and figured out a haphazard ratio and tried it out. Here’s the ratio we ended up with, though we made twice this amount. This is where having a good friend comes in handy. 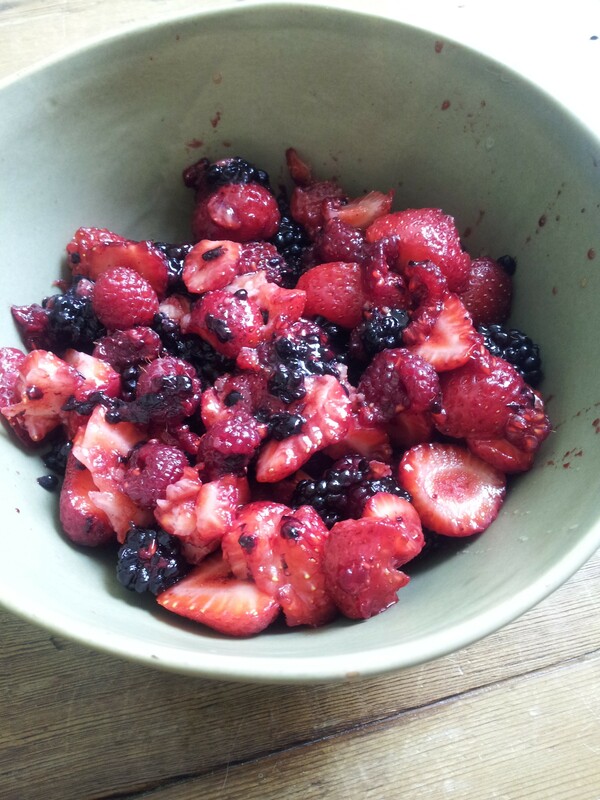 We hulled the berries, and smashed them up with a pastry blender, stirred in the sugar and vanilla bean and then cooked them until foam started rising to the surface. We skimmed it off and continued cooking maybe 10 more minutes and then filled the jars and processed the jam. What we got was a bright flavored, jewel-like strawberry jam, somewhat loose and spoonable into yogurt, while a little drippy on toast–just the way I like it. 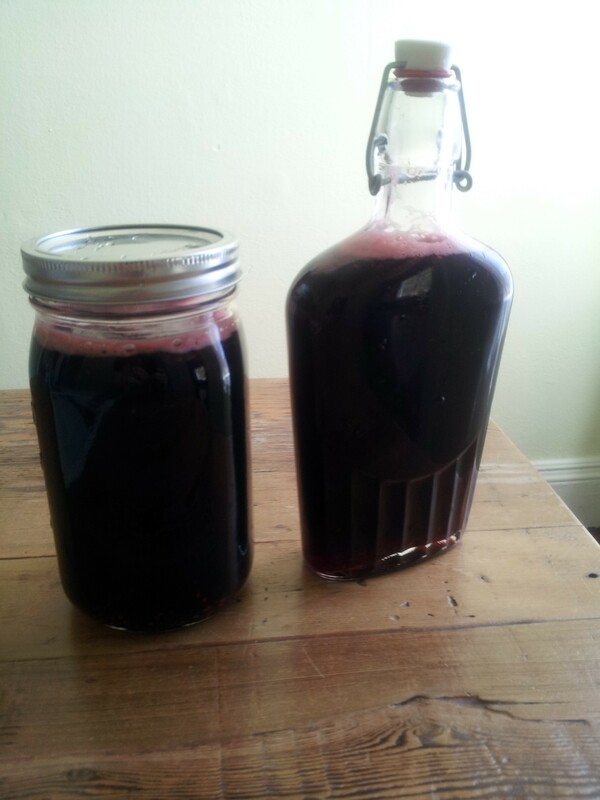 PS: 1 flat of strawberries yielded a lot of jam. something like 22 pints! Yowza. Usually I’m planning at least four meals ahead in the part of my brain especially reserved for such musings. However, once in awhile, I find myself sitting at my desk, starving and uninspired at 12:30 or so. On one such occasion I raided the pantry and the vegetables from my CSA box to create a light, quick, high energy springtime salad. It has plenty of protein from chickpeas and canned salmon and lots of flavorful, seasonal veggies. 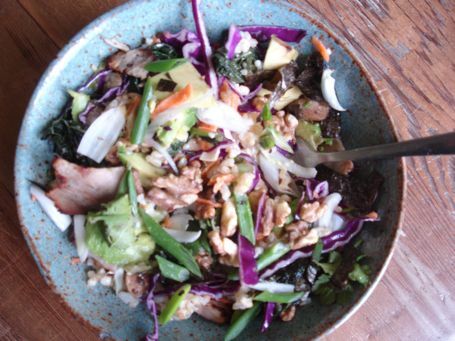 Brown baggers can whip up this highly portable salad the night before or early in the morning before work and forgot about relying on the local takeout. Makes two generous servings. In a large bowl, combine the chickpeas, salmon, radishes, turnips, onion, celery, and carrot. Toss in the dressing and season to taste with salt and pepper. Pile the greens onto two plates (or shallow bowls), dividing them evenly. Top with the dressed salad. Garnish with avocado, nori, parsley, and cilantro. Serve immediately or refrigerate (separate from garnish and greens) for up to 2 days. This salad travels and keeps well. I created this recipe for a couple of different friends who sell local lamb and wanted some new recipes to share with their customers. 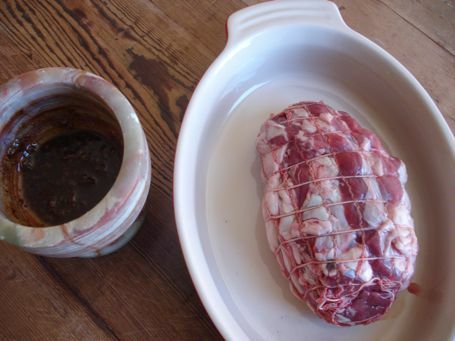 Below you’ll find instructions for a small sirloin roast and also for sirloin chops, but you can make this salsa and use it on roast leg of lamb, rack of lamb, or whatever cut you like. I think it would even be good sprinkled over lamb stew. It’s also great on sandwiches made with leftover lamb. Pastoral Plate is the meat CSA and buying club that I’ve been ordering chicken, beef, lamb, eggs, and other goodies from. Run by Jonathan Lewis, who personally visits all the farms from which he sources, Pastoral Plate is a great source for local meats in San Francisco that I highly recommend. 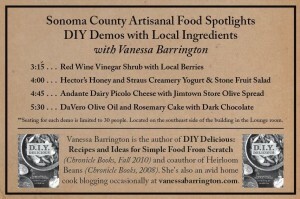 They’ve also been selling a killer sheep’s milk feta that would be great in this recipe, but any good feta will do. Casa Rosa Farms is run by my friends Rachel and Anthony in Madeira (whose house in Oakland I used to live in). They raise gorgeous California Red sheep and just started selling their organic olive oil and meats at the Kensington Farmers’ Market and the Alameda Farmers’ Market. If you like videos of adorable lambs, fan them on Facebook. 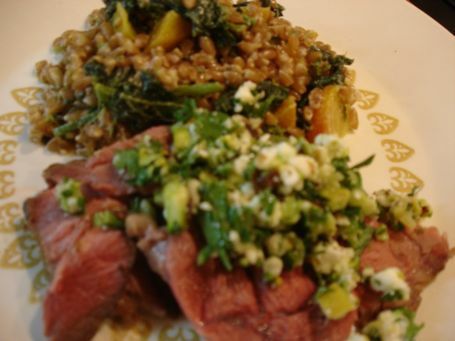 To accompany my lamb, I cooked up a little farro and tossed it with steamed broccoli rabe, golden beets, and a super light blend of tahini and plain yogurt. It was fantastic with a glass of rosé on a recent warm night. If making a roast, preheat oven to 200 degrees and remove roast from refrigerator. Heat a skillet over medium high heat and add a little olive oil. Brown the roast all over and transfer to the oven. Roast for about 2 hours until the temperature inside is 140 degrees. Remove from oven and let rest before slicing. 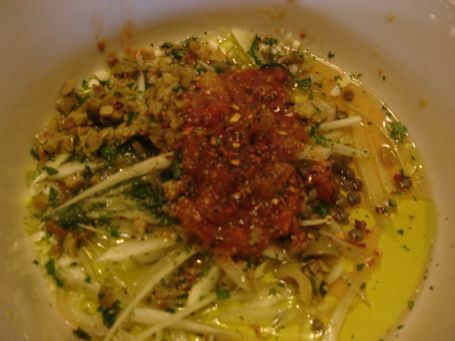 Combine all the ingredients, adding the olive oil last, until the salsa is chunky but spoonable. If making chops, prepare the salsa before you start cooking. Grill them over a medium hot fire to desired doneness or cook them in a hot non-stick skillet with a little olive oil. Serve slices of the roast or whole chops with the salsa spooned over. Sorry about the blurry photos. It was dark! But I promise it tastes good, even if it doesn’t look so great. 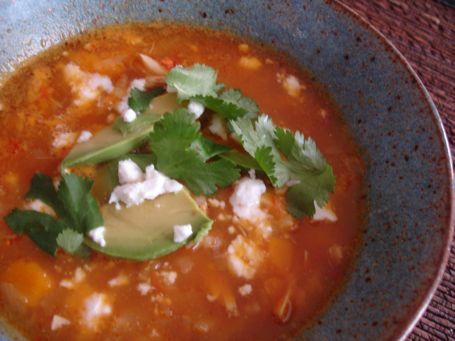 With more rain in the forecast, I wanted to share this hearty, healthy soup that I created recently. Lately I’ve been enjoying cooking down the pantry (my version of spring cleaning) and utilizing the vegetables from my beloved Eatwell Farm CSA box to make simple meals. This one was inspired by a recipe in the Zuni Café Cookbook that used leftover farro cooked with porcinis to make a porridge-like soup. Quantities are somewhat loose as I didn’t measure. Feel free to double this, as it’s better the next day. Keeping quarts of homemade chicken broth in the freezer (made from a mixture of roasted carcasses and fresh heads, feet, and necks from Soul Food Farm birds) makes delicious soups come together fast. Feel free to use store-brought broth or water, and you’ll still have some winter comfort in no time. I also keep guanciale in the freezer so I can cut off chunks when I need it. No need to defrost. If you don’t have it, no worries, this soup would still rich and wonderful without. Cook the farro in boiling salted water until firm but tender, about 45 minutes (can be done a day or hours ahead) Drain and set aside. Meanwhile, soak the porcinis in about a cup and a half of warm water. In a large, heavy soup pot, warm the oil over medium heat and add the guanciale. Cook, stirring, until translucent and beginning to brown. Add the onion, celery, carrot, and garlic, lower heat, and cook until the vegetables are soft and fragrant, stirring occasionally, about 10 minutes. Drain the porcinis, straining and reserving their soaking water. Add the broth, lentils, greens, drained porcinis and their soaking water, and cook until lentils are tender, about 30 minutes. Add the farro and salt and pepper to taste, and continue to cook to allow flavors to meld, about 10 minutes. Serve drizzled with olive oil and topped with grated Parmesan cheese. After a flurry of inspiration and posts over the cooking holidays, I’ve been remiss about updating my blog lately. But that doesn’t mean I haven’t been eating (and cooking! ), it just means I haven’t been cooking anything I’d consider to be necessarily ground-breaking. But yeah, I cook and eat every day, as we all have to do. Here I share a smattering of recipes that indicate the types of dishes I make on regular ole weeknights from common ingredients. The types of dishes that I eat and enjoy thoroughly, but I don’t really talk about much. I originally did this post for Ecosalon, and I’m happy to share it here. Enjoy! Put the potatoes whole into a steamer basket and steam until tender. Meanwhile heat a couple tablespoons of olive oil in a skillet, add the garlic and sauté gently. Add the kale and stir to coat. Add a little water, cover, lower heat and cook kale until tender, stirring occasionally. Add the potatoes to the skillet with the kale and smash them together with a potato masher. Add olive oil, salt and paper, and grated cheese to taste. Serve hot with an egg on top (if desired). In a soup pot, warm the olive oil or butter. Add the onion and garlic and cook until soft and fragrant. Add the rice and stir to coat. Add the spinach and sauté until soft. Add the broth and lower heat to a simmer. Cook until rice is tender, about 15 minutes. Season to taste with salt and pepper. Serve with grated cheese on top, if desired. This one is free form. Add any selection of vegetables you like in your salads. Use any dressing you like, or make this one as directed. Stir in Harissa paste or pesto if you have it, or not if you don’t. Gently warm the chickpeas in a small saucepan as you prepare the rest of the ingredients. Make a quick dressing with the garlic, lemon juice, and olive oil. 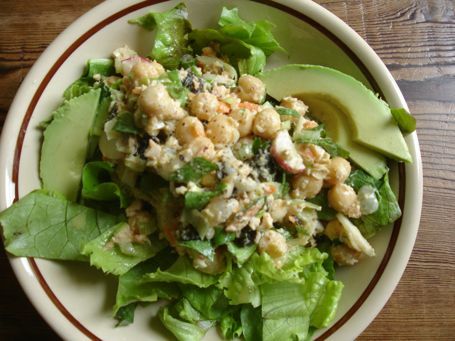 Combine the warmed chickpeas, salmon, salad greens, and vegetables in a medium bowl. Toss with the dressing and season to taste with salt and pepper. Warm the olive oil in a medium pot. Add the onion and garlic and cook until soft and fragrant. Add the lentils and water to cover by one inch. Bring to a boil, lower heat to a slow simmer and cook until the lentils are tender, about 20 minutes. Add the sausages, greens, paprika, and salt and pepper to taste. Cook until everything is warmed through and the greens are tender. Add the lemon juice just before serving and correct seasonings. 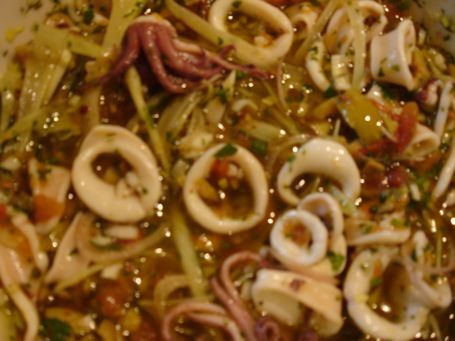 Heat the oil in a large soup pot, add the onion and cook, stirring until tender and fragrant. Add the vegetables and the coconut milk and enough water to cover. Bring to a simmer and cook until the vegetables are nearly tender. Add the curry paste and salt and pepper to taste. Continue to cook to blend flavors and until vegetables are the desired softness. Serve over white rice garnished with chopped cilantro. Toss the sweet potatoes in 1 tablespoon olive oil with a little salt, and put them on a baking sheet. Roast in a preheated 400 degree oven for about 15-20 minutes or until soft and beginning to crisp and brown. Halfway through the cooking time, slide a spatula underneath the potatoes to loosen them and flip them over gently so they don’t break apart. Meanwhile, cut the sausages into bite-sized pieces and brown and warm them in a skillet with a little bit of oil. In a small bowl, whisk together the vinegar, maple syrup, mustard, and a tablespoon or two of olive oil. Toss the cooked sweet potatoes and sausages together in a medium bowl. 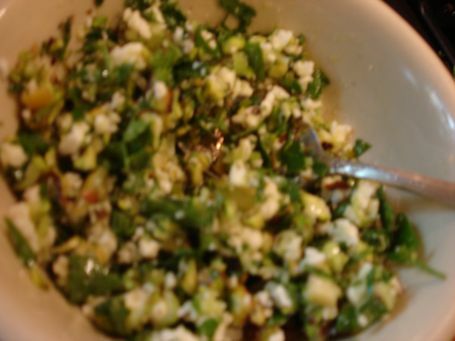 Add the green onions, parsley, and dressing. Season to taste with salt and pepper and serve warm. In a large bowl, beat the eggs until smooth and add salt and pepper. Stack the tortillas and cut them into eight wedges. In a large cast-iron skillet over medium heat, warm the 2 tablespoons of vegetable oil. Add the onion, and cook until soft. Increase heat to medium high and add the tortillas. Cook, stirring occasionally, until brown and crispy. Pour in the salsa, and stir to blend. Add leftover meats or beans (if using). With a wooden spoon or spatula, move the tortillas and salsa to one side of the pan, add the teaspoon of oil to the other side and pour in the eggs. Scramble the eggs for a few moments until nearly cooked. Stir them into the tortillas and mix together. Serve immediately garnished with cilantro, cheese, and avocado. 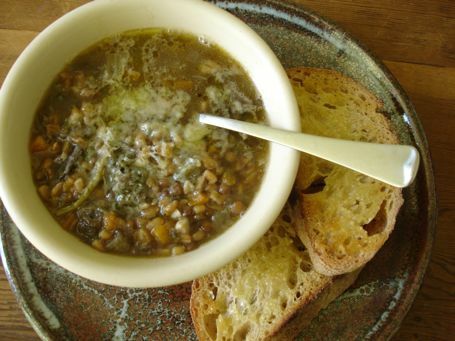 I first made this soup a couple weeks ago with a small, Soul Food Farm stock bird. I used a technique I use often that provides me with a light but full flavored broth to freeze and use for soups and also a good amount of shredded chicken meat to use for enchiladas, tacos, salad, what have you. Basically I simmer a whole chicken with aromatics for about 15 – 20 minutes and then turn the flame off and cover the pot for 45 minutes or so (depending on the size of the bird). It finishes cooking and comes out tender and succulent, not like you’ve boiled the crap out of it. Anyway, today I’m recommending you just use whatever broth you have, or make a broth out of your turkey carcass and use it to make a turkey version of my chicken soup. You can even use some fried tortilla strips to make a classic tortilla soup. But the day after Thanksgiving I want something light, spicy, warming, and hearty. And I want to skip the fried stuff. Remove the stems and seeds from the chiles and slit them down the sides so they open up flat. 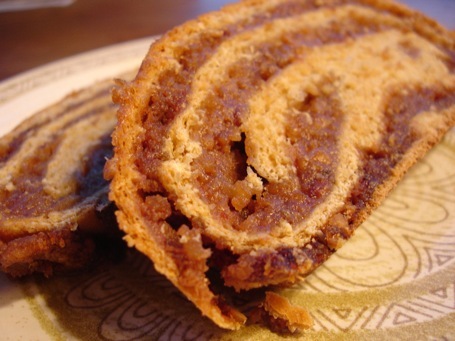 Toast them briefly in a cast iron pan over medium heat until they are fragrant but not burned. Place them in a bowl and pour in hot water to cover. Weigh them down with a small plate to keep them covered. Let them sit for 20 – 30 minutes while you prepare the remaining ingredients. Put the broth in a large soup pot and bring to a simmer. Add the squash, cabbage, and rice, and simmer on low until rice is done and squash is tender (about 20-25 mins). As soon as the chiles are soft enough, puree them in a blender or food processor with enough of their soaking water to make the mixture pourable. Add it to the soup whether the rice and squash is tender or not. Continue to cook until all the vegetables are tender and the flavors are blended. Add the shredded turkey and season to taste with salt and pepper. Serve immediately, garnishing each serving with a squeeze of lime, a crumble of cheese, some diced avocado and cilantro leaves.